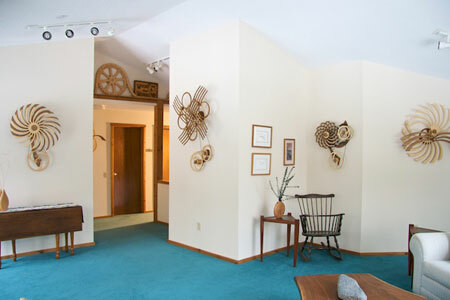 My woodworking studio and gallery is located in scenic, rural Ashford in northeastern Connecticut not far from I-84. This is the main route between New York City and Boston. The studio is open by appointment so call ahead if you are planning a trip in this direction. All current sculptures are on display in the gallery area as well as a few "golden oldies" from the early years and sometimes one or two new ideas I'm working on. Being in a room full of kinetic sculptures is an experience worth having! Kinetic Art of display in the studio of David C. Roy, kinetic sculptor. We are located just off Exit 72 on I-84 in Ashford, CT. This exit is CT Route 89. Exit and turn south (left if coming from MA and right if coming from Hartford). Go about 200 ft and take your first right onto Frontage Road. Follow for 1 mile, taking your second left onto Old Town Road. David's studio is the first driveway on the right. It is a blue house at the top of steep paved driveway. It is number 229. There is no Wood That Works sign. Google maps places the studio about 500 feet further down Old Town Road so don't miss it.